I conducted this interview with Kevin Brownlow in September 2008 and it was originally published in French. I feel that the original text needed to be published as well now that he is receiving the recognition he deserves from the Academy of Motion Picture Arts and Sciences. In this original transcript, you will meet the film-maker who directed two fiction films. He speaks with his customary self-deprecating humour. Another four parts will be published in the following days. Vous pouvez lire la traduction française et écouter des extraits sonores sur le site DVDClassik. Which film sparked your interest in cinema for the first time? The curious thing is I don’t think I can answer that. I have to go back to the beginning and I know that when I was sent to boarding school at the age of three, we were never shown films except by a charity called Dr Barnardo’s. And they used to come to the school to collect the money from the little boxes that were in our halls and as a thank you, they would show us the home movies that the teachers had taken at the orphanages for Dr Barnardo’s. And they were on 9.5 mm and even though I had never seen a film in my life, I knew these were terribly badly shot and I hated them. So when I was taken to the cinema for the first time, around 1941, it was Snow White and the Seven Dwarfs, but the first film that came on was a newsreel and I thought the quality was superb. I think that set my standards for what a film should look like. Although it also proved my technical lack of hability technically. I remember they were four naval officers walking towards the camera and I was waiting for them to fall into the cinema, fall off the screen, fall into the cinema…I was terribly disappointed when they disappeared at the side of the screen, I presumed they had gone into the wings. Anyhow I ran out screaming from Snow White. The wicked Queen was terrifying and this is the only time when I had to be persuaded back into the cinema. I remember my mother pursuing me in the grand hall of the Ritz theatre in Tunbridge Wells. She knelt down and persuaded me to come back in that it was just a film. That’s what they all say, isn’t it? So very very reluctantly I returned to Snow White. But I cannot remember what it was that put me in…that really turn me on to cinema. I don’t think I saw very much after that. I went to another boarding school and this was very different from the other one. It was a very unpleasant place like Colditz. And it was the winter of 1947 which was the worst winter of the century. It was so cold; it was unbelievable. But our parents were only allowed to visit every third week end, and the headmaster used to tempt us back from those meetings with a film show in the winter. And I remember it was in the chapel of the school with stone floor. I used to sit on that stone floor as close to the projector as I could get so there was already some attraction. And they were showing a version of Oliver Twist, a 1933 mute version of the film produced by Herbert Brenon with Dickie Moore. First of all I was fascinated by the fact that the benevolent old gentleman was called Mr Brownlow. Then I was fascinated by the fact that you could convert anything into a cinema just by blocking out the light and putting up a projector and a screen and that really fascinated me. And I remember the film jammed. A prefect was projecting and he did the unforgivable thing to pulling it through and he lost the loop and it broke. And some frames fell next to me. When the show was over, I picked these frames up and rushed to the dormitory which was completely black, picked up my torch from above my bed and stood in the middle of the room and switched on the torch in front of this piece of film expecting to see a theatre quality image on the wall…extremely disappointing! But I remember from that moment on, I wanted a projector. And I went on and on with my parents. I must have 10 and it was Christmas. I saw a package that looked very promising and I tore it open and sure enough it was projector. But there was something wrong with it. The film it showed at sprocket holes on either sides but it was quite large film. And I realised when I got it up to the bedroom to try it out that it was a still projector! I had forgotten to say movie or film… Anyway the following year I got –I had made my preference known- I got a film projector and once again being technically hopeless I couldn’t get the bulb in the right place and it looked awful…back to Dr Barnardo’s standards! Then I suddenly accidentally moved the bulb and it illumined the image properly and I suddenly saw it as it was meant to be seen and it looked great! And that was very exciting. I got two films: a Mickey Mouse and the one that really impressed me was the Naval Review at Spithead, 1935. When did you when you started collecting films ? After running those to death, I went out to the streets of London to look for more. And I didn’t know where to go. But I took a bus to Baker Street and found myself in George Street where there was a photographic shop and I asked if they had any 9.5 mm film and they did! A little pile of them came down from the shelf. They fell all over the floor I remember and the shop assistant had to go down on her knees to pick them up. They were at one pound and six shillings a reel and I happened to have the right amount of money to take them all. I got them home and started to show them to my parents. My mother got very excited because she said: ‘That’s Douglas Fairbanks!’ and I thought she making it up because even I had heard of Douglas Fairbanks. How could I have had suddenly a film with Douglas Fairbanks? And then the next one had William S. Hart, and the next one had Bessie Love! So I got really excited about this. The films were terrific. The Fairbanks one was missing the beginning. I had no idea what it was. But since he was so famous, I thought all I had to do was to go to the local library and there would be a book. I would take the book off the shelf and it would fall open at a picture of my film and tell me all about it. They were no media studies in those days, of course! I went to the library, I took the book and it fell open at a picture from my film and there was the description! It reveals it’s American Aristocracy (1916) and it gives all the details about it. Oh my God! If I have film which is in a book, I’ve got to find some more! This is what turned me on to being a collector. But that Douglas Fairbanks film fascinated me. Number 1: it had a beautiful photographic quality, even though it was 9.5 mm, it looked really good like that newsreel I had seen. Second of all: it was very fresh and bright and funny. Fairbanks’ personality came over…this had been reduced to three 60ft reel from 5 reels. And it had a hydroplane in it. Fascinating! Shot in 1916, it had the latest motorcar, but it looked so prehistoric isn’t the word…That was fascinating too! And later on I heard about the BFI, went along there and discovered they had a thing called the Index to the films of DW Griffith by Seymour Stern and Griffith was supposed to have produced this film which he had nothing to do with it. He was in the West and it was made in the East, but it had the cast. And I learned that cast by heart. And a few years later when I joined the film industry, I kept hearing people talking about a actor’s agency, called the Al Parker agency. And I knew, having a one-track mind, that this was the Albert S. Parker who had played the villain in American Aristocracy. So I rang him up. And I said: ‘Does the name Douglas Fairbanks mean anything to you?’ He said: ‘Douglas Fairbanks! Jesus Christ! I directed him!’ ‘Whom did you direct?’ ‘Fairbanks in The Black Pirate!’ I said: ‘I think I got your first film!’ He said: ‘Bring it over!’. So I took my projector and the film and I went to see the fellow who played the villain in this, it was uncanny. And we ran it on the wall and he got his wife in, I had to run it again. Then he got so interested that he organised a dinner. And he got James Mason, Trevor Howard, Clive Brook, Hardy Kruger, all these people….anyway, this is how it all started. What did you want to become at that age: a film director, an editor or a film historian? I wanted to go into the Navy! My father was a commercial artist connected to the film industry in this he did the lettering for film posters. You may think that’s all printed but it was actually hand drawn and really difficult work. And he warned me against the film industry. He knew enough about it and that I wouldn’t get on with it. So I kept away from it. But one thing I couldn’t stand was school and I was having to do A-Levels and after school, you go to university and all the rest of it and it just stretched forward the academic side into infinity. I knew I wouldn’t get into university, but at the same time I couldn’t see any alternative. But then, I had been making an amateur film and one of the actors in it had got a job as an office boy at a documentary film company. And he was told if he could get a replacement, he could go into the cutting room. So he said to me: ‘Look! How about taking over this job as office boy? You get £4.10d a week and you would be getting a foothold in the film industry.’ ‘I don’t think I want to be in the film industry!’ Then I thought, I’ve got another year to go at school. It would be great to get out of that. So I accepted and that’s what got me into the film industry. Can you tell us how you made your first amateur picture? I think I was about 14 when I started making The Capture and it took me three years to finish it. It’s very short too. It took that long because I had to save up the money to get the film and so on. Then that was finished and that did get a certain amount of coverage in amateur film circles. What it did for me more than anything else, it brought into contact with a man called Derek Hill who was the assistant editor of Amateur Cine World and he came to see me to find out about this film. And then I told him about my silent films. So he said: ‘Why don’t you write articles for amateur cineworld?’. He had a word with the editor and these articles were commissioned. I couldn’t write…Poor Derek had to write my articles for me at the beginning. He taught me how to write. That was the most valuable thing about that film. In 1954, my first articles were published in Amateur Cine World and I became a writer because of that. How old were you when you started making It Happened Here? Did you realise what a vast undertaking it would become when you started it, especially without any budget? Well, I knew it was a vast undertaking and that interested me. I wanted to make epics. 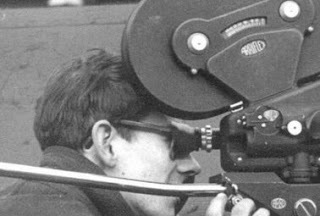 What I couldn’t stand about amateur films is that they were all so tiny and so unambitious. I thought if you were going to make a film outside the industry, there is no reason it shouldn’t look as good as one that’s made within the industry, I mean…how I thought I would pay for it, I did not know but that’s the feeling I had. If we are doing a crowd scene, let’s have a crowd. So I took advantage of such things as –there was a Battle of Britain exhibition in which they brought out German aircraft all over Whitehall. 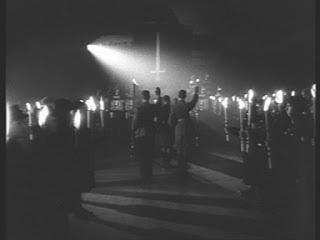 Horseguard’s Parade was full of Messerschmitts, Heinkels, Dorniers and I wrote the sequence around that with the characters in my film. But the trouble was I had no script and no story, I didn’t know what I was doing. I was playing around: adolescent exhibitionism, that’s what it was! And my actors were leaving me and I kept reshooting. It was awful! And I went down -we needed more uniforms- I went down to Portobello Road because I heard they were selling German uniforms. I found a stall that sold helmets. I was buying these helmets and I said to this chap: ‘Do you know any collectors? That’s what I really want.’ He said: ‘There is one!’ And there was a boy standing next to me, extremely youthful [Andrew Mollo was 16], dressed in a Victorian outfit, he seemed to have made for himself. And I talked to him. I decided to reveal a secret I had been told, I said: ‘Did you know that in Kensington there is a Russian family that has got a lot of Third Reich material?’ He said: ‘Yes, I think that’s us.’ I said: ‘Oh!’ He took me home. I was very worried because I thought number 1, he was going to be a Nazi nad when I went into his room it was painted red, white and black, the German colors. It had a bust of Hitler on a table and there were German helmets and uniforms and everything all over the place. It was astonishing! So well I thought, even if he is a closet Nazi, let’s use, let’s get the stuff out of him and use it in the film. Well, he was perfectly willing to come on to the film but he wanted to see what I had shot. So I patronizingly took him home and switched the stuff on. He is going to be knocked down by this. And in the end, he was terribly disappointed. He said: ‘Everything in that is incorrect!’ I said: ‘EXCUSE ME! What’s incorrect about it?? ?’ (laugh) he told me, he went through one thing at a time; every single thing was wrong… And at first I didn’t know what he was talking about, but I realised that he did know his stuff. And if I was going to work with him I’d better follow his advice. And we did a session in which everything was correct and the difference was night and day. So I had to throw everything away again… Except that I could bring myself to throw away the Trafalgar Square rally and that’s still in the film. We started from scratch in 1957. And he earned nothing, he was an art student. I earned by now £6.10 a week. So we had to save up for a roll of film and one Sunday morning, got into Trafalgar Sq or nearby to shoot it. It last two and a half minutes. It didn’t take long to shoot it and that was it. Then we had to wait another 3 months. It was ridiculous! Anyway this is how the film started. Why did you select such a burning subject as the German occupation of Great-Britain? Well, first of all, I was born into the war and I didn’t think there was anything else for the first 6 and 7 years of my life, I thought this was normal life. You know…V1 came over and were attacked by Spitfires, you picked up the shrapnel and you watched the flak. It was all frighfully entertaining! (laugh) I loved it! (laugh) At the same time, I was moving away from the little boy who wanted to get into the Navy, I was becoming pacifist, but like Abel Gance I was a pacifist fascinated by the military. And with Andrew being a military historian as well and his father…My God! I forgot to mention that. He lived in a house in Kensington and each brother had a floor devoted to his particular interest. One brother was fascinated by the British army, he was John Mollo, he was also fascinated by the French Army and he ended up winning two Oscars, one for Star Wars, one for Ghandi. Then there was a middle brother who worked at the National Army Museum later on and then there was Andrew with his German stuff. And the father was a Russian, he had been unusually in the White Army as well as the Red. And he got out through China I think. He was one of the most fascinating people I have ever met. And I always think he was my substitute university. He used to teach me History. At dinner, he would tell me these wonderful stories about WWI, WWII, extraordinary! So Andrew and I were completely, and are still, completely besotted with this period. What we wanted to do, what I wanted to do at the beginning was just a straightforward action film like those dreadful war films of the 50s. But gradually I realised that if this was going to have any value at all, it would have to be more about the politics. So we had to learn a lot about the politics and I realised, My God! no film had been made and still hasn’t been made, nobody has made a feature film which tells you what National-Socialism was. Nobody has made a film which tells you why we were fighting them. So I thought it was interesting enough. It got us into a tremendous amount of trouble because in order to do it properly, we have to had real Nazis. I should think, the reputation we got out of that film finished me, finished either of us as directors in the film industry. Did you know what kind of look you wanted to achieve when you started shooting? No! I just pointed the camera, because I was photographying it myself at that time, and hoped. I was always disappointed when I saw the rushes. 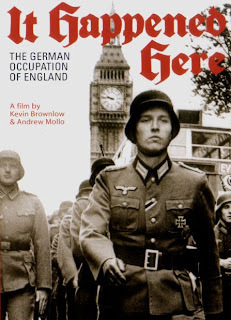 It began to change when Andrew brought back a book called ‘Paris sous la botte des Nazis’ and in there, were photographs taken during the German occupation of France and I could see what it ought to look like. And so we tried to get that same look. And eventually, I think we succeeded. We realised what it should look like is a newsreel. And, in fact, remembering the Orson welles thing, I stole his idea of a newsreel within the film. 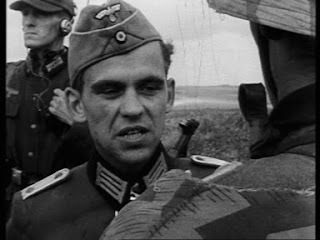 And I had the chief character go to the cinema and see a German propaganda film. In order to shoot that, I made it as close to a newsreel as I could with juggering camera and bad cutting and all the rest of it. And funnily enough, my assistant at that time was Peter Watkins, when he started making war films too, he adopted the approach of newsreels and he was a purist he made them so much like newsreels, he had television interviewers in the fields of Culloden. Extraordinary! We used to have tremendous arguments, that was also rather like a university! Aesthetic arguments about film. I felt film craft was important to preserve, you shouldn’t make it like a newsreel so that it obscured the artistry that the film necessarily has. The look we got was right and it was confirmed when an Italian film was made recently, La Grande Storia, which is about Nazi propaganda, and they had an extract from a film called The conquest of London, 1941 which was found in the archive of the vaults of the former Reichsfilmintendant, Fritz Hippler. It was allegedly made to prove that the German had occupied England. When I saw it I couldn’t believe it because they had taken It Happened Here and they’d taken the soundtrack off and they’d put an Italian commentary on it and pretended it was real! What is more they showed it to a conference of historians and researchers! You worked very often with a co-director. On It Happened Here, your co-director was Andrew Mollo. Did you feel that team work helped through such a complex production? Oh God! I couldn’t have done it without him! But the rows we had, you couldn’t believe it! It was tremendously valuable and in fact it became my standard method of working is to find a really sympathetic person who wants to do the same, like David Gill, although, you know, it was accidental casting, he turned out to be perfect. And Christopher Bird, the most recent collaborator, I’ve always found it’s so much more fun to work with someone else than to do it on your own. And Andrew was the most extraordinary character because when we were doing a film on the XVIIth century, we would be driving along when he would suddenly stop and reverse. Through a hole in the hedge, he had seen a spoke and in his mind, he had realised it was the spoke of an old cartwheel. And he went to that farmyard we would find a cart of the type we could use in the film. (laugh) and sure enough we did! He had an uncanny sense of finding things. Whenever he would talk about something, a week later he would actually produce that actual object. It was quite an extraordinary experience. Were you influenced by a particular film-maker for It Happened Here? For It Happened Here, no. The war films we saw we hated. Those British war films in the 50s. they were so incorrect, Andrew kept telling me. I suppose, in a sense, the figure we most respected was Erich von Stroheim because we tried to do what he did: everything in front of the camera had to be accurate because everyone in the audience is a specialist in something. It was fascinating to get it right and to look at it on celluloid. It looked so different to the adequately reconstructed which was the British film of that period. On Winstanley we had influences but on IHH, except again, Orson Welles, ‘what might have happened if’ like War of the Worlds. I’d read John Wyndham and George Orwell. I had a fascination for that sort of thing in those days. I think I’ve got over it now! (laugh) A very familiar England under very extraordinary circumstances. And the film Seven Days to Noon, I had forgotten about that, it ought to be reissued because it’s about a terrorist with an atomic bomb in a suitcase which is now possible. It was a ridiculous idea in 1949 or 50 when it was made. But it was extremely convincing. It had the evacuation of London and that’s why I did the evacuation scene in our film. The Boulting brothers made Seven Days to Noon. These were the influences. How was it received by the critics? It got extremely mixed reviews. It got very bad reviews from The Daily Telegraph and raves in The Sunday Observer. My favourite review of the picture by Robert Robinson, he said: ‘it’s like seeing a snapshot that everybody has forgotten of the Occupation.’ What he said in that review was exactly what I had prayed somebody would say. But we also got: ‘A weak story of Nazi Britain’, that’s the first one we got from the bloody Daily Telegraph. I’ve never had a good review from The Daily Telegraph in my life, awful! 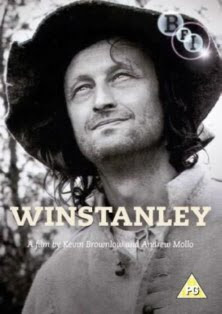 In 1975, you directed another feature with Andrew Mollo, Winstanley. It follows the fate of a group of peasants at the time of Cromwell. Why did you select this subject? We wanted to make another film and after It Happened Here, we decided to do another historical occupation which was the Norman occupation. The authoress of a book called The Golden Warrior about Harold and William, had seen our film and said: “That’s the way to do this.”, got in touch with us and said you can have the book, make the film. So, Oh right! How exciting! Let’s do it! The film industry will hire us because all this was done to try to get a job in the film industry. They didn’t want us when we finished it. So there, here we are again. So we thought, we must get an agent. We got ourself an agent. So we thought we must have a proper screenwriter, I am not a good enough screenwriter, we must have a proper screenwriter. So we got Howard Clewes who had written Mutiny on the Bounty and this agent handed us over to a female agent called Robin Dalton and we had discussions with Howard Clewes about the approach we wanted etc. And he went off to write it and fade out, fade in. Nothing happened. We heard nothing. And somebody told us Michael Winner is making a film about the Norman invasion of England; he’s got Howard Clewes writing the script for him. Our agent realised there was no money in us, so she shifted Howard Clewes to Universal Pictures. So that was the end of that. And that sort of thing kept happening, we kept getting stymied in our approach. We would write an idea and it would be rejected by the big companies. So finally, Miles Haliwell brought us this book, Comrade Jacob, it was called. And we tried to get that thing off the ground. Again, nobody wanted it. I remember one producer called Robert Solo. He said: “I’ve read your script. I think it’s just magnificent. But I don’t like Winstanley. I don’t believe you have to like the leading character. I mean in Ghengiz Khan of Henry Levin, you don’t like Ghengiz Khan but he has a fine relationship with the girl!” (laugh). So that was what we had to put up with. And we got nowhere. And eventually, a fellow called Mamoun Hassan who had been my assistant as an editor, got the job of running the BFI production board. And he decided that the sort of film that he was going back was the sort of film the industry wouldn’t. Like the Bill Douglas’ triology and the Terence Davies films and so on. And he said: “What about Comrade Jacob? Why don’t you submit that?” So we did and it was approved. So we had to make it.